Uncle Sam says no to AT&T eating up T-Mobile: The Department of Justice has filed an antitrust suit against AT&T, Bloomberg reports. Things just got real. The US says "AT&T's elimination of T-Mobile as an independent, low- priced rival would remove a significant competitive force from the market." Yep, pretty much. AT&T's efforts just got a hell of a lot harder—the DoJ doesn't take kindly to monopolistic encroachment, and when the crosshairs are up, they're rarely lowered. Update: AT&T's stock is currently down over 4 percent. Update 2: The WSJ points out Sprint's stock is currently up over 9% after the news. This'll fluctuate all day, but no matter what, the antitrust complaint is good news for Sprint—who's been fighting the merger tooth and nail, on the national, state and local levels—and those who own its stock. "The combination of AT&T and T-Mobile would result in tens of millions of consumers all across the United States facing higher prices, fewer choices and lower quality products for mobile wireless services," said Deputy Attorney General James M. Cole. "Consumers across the country, including those in rural areas and those with lower incomes, benefit from competition among the nation's wireless carriers, particularly the four remaining national carriers. This lawsuit seeks to ensure that everyone can continue to receive the benefits of that competition." "At a time when many Americans are struggling and our economy faces significant challenges, we're pleased that the T-Mobile merger allows us to bring 5,000 jobs back to the United States and significantly increase our investment here." Misleading because however many jobs AT&T magically creates with this merger, they'll likely be eliminating just as many thousands, since that's the kind of "cost-reducing synergies" or whatever that companies merge for in the first place. Cynical because if they really cared that much about American jobs for their own sake they've have kept them here in the first place. Update 5: Mobile industry expert and analyst Phillip Redman of Gartner tells us the AT&T-Mobile deal now has a "Very, very slim chance" of going through. He added that although he believes the DoJ's suit is unwarranted on the grounds of anti-competition, "It's very doubtful that this deal will ever happen" with AT&T as suitor. FCC Chairman Julius Genachowski said, "By filing suit today, the Department of Justice has concluded that AT&T's acquisition of T-Mobile would substantially lessen competition in violation of the antitrust laws. Competition is an essential component of the FCC's statutory public interest analysis, and although our process is not complete, the record before this agency also raises serious concerns about the impact of the proposed transaction on competition. Vibrant competition in wireless services is vital to innovation, investment, economic growth and job creation, and to drive our global leadership in mobile. Competition fosters consumer benefits, including more choices, better service and lower prices." We are surprised and disappointed by today's action, particularly since we have met repeatedly with the Department of Justice and there was no indication from the DOJ that this action was being contemplated. We plan to ask for an expedited hearing so the enormous benefits of this merger can be fully reviewed. The DOJ has the burden of proving alleged anti-competitive affects and we intend to vigorously contest this matter in court. We remain confident that this merger is in the best interest of consumers and our country, and the facts will prevail in court. So AT&T's sure not giving up on their longterm plans, and we can expect a legal battle against the DoJ. Update 8: PC Mag's Sascha Segan raises an excellent question amid all of AT&T's bleating: "Why can't AT&T bring call center jobs back to the US if the deal isn't approved? Nobody's stopping them." Update 9: You can read the DoJ complaint in its entirety here. The Department filed its lawsuit because we believe the combination of AT&T and T-Mobile would result in tens of millions of consumers all across the United States facing higher prices, fewer choices and lower quality products for their mobile wireless services. As can be seen in the Department's complaint, AT&T felt competitive pressure from T-Mobile. One example cites an AT&T employee observing that "[T-Mobile] was first to have HSPA+ devices in their portfolio…we added them in reaction to potential loss of speed claims." So as you can see, a merged AT&T and T-Mobile would combine two of the four largest competitors in the marketplace, and would eliminate T-Mobile, an aggressive competitor, from the market. [T-Mobile] compete[s] on price, plan structure, network coverage, quality, speed, devices, and operating systems. A combination of AT&T and T-Mobile would eliminate this price competition and innovation. Update 11: Sprint just chimed in—surprise, they're really happy! "The DOJ today delivered a decisive victory for consumers, competition and our country. By filing suit to block AT&T's proposed takeover of T-Mobile, the DOJ has put consumers' interests first. Sprint applauds the DOJ for conducting a careful and thorough review and for reaching a just decision – one which will ensure that consumers continue to reap the benefits of a competitive U.S. wireless industry. Contrary to AT&T's assertions, today's action will preserve American jobs, strengthen the American economy, and encourage innovation." Update 12: Deutsch Telekom, T-Mobile's owner, has responded to the stymied buyout. They're not happy! Deutsche Telekom is very disappointed by the DOJ's action, and will join AT&T in defending the contemplated merger against the complaint in court. DOJ failed to acknowledge the robust competition in the U.S. wireless telecommunications industry and the tremendous efficiencies associated with the proposed transaction, which would lead to significant customer, shareholder, and public benefits. We appreciate the DOJ's willingness to discuss possible remedies to address the competitive concerns. Update 13: This Is My Next has an email circulated by T-Mobile CEO Philipp Humm, in an attempt to calm the troops. Many of whom were probably going to be fired if this deal went through. Oh well! 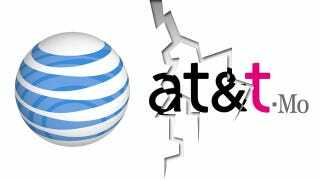 By now you have heard the news that the Department of Justice (DOJ) has filed a lawsuit to block the AT&T and T-Mobile merger in U.S. District Court. We were surprised by this sudden announcement, and DT will join AT&T in challenging the DOJ's case in court. DT and AT&T believe the DOJ has failed to acknowledge the significant consumer benefits of this deal. DT remains convinced that bringing together these two world-class businesses would create significant benefits for customers and the country. While this action is addressed in Federal court, the best thing you can do is continue to focus on strengthening our business and offering world class customer service. Customers have many reasons to choose T-Mobile-from the great value we offer, to compelling devices running on America's largest 4G network and our leadership in customer service and satisfaction. Working as a team, we will continue to prove there's no better time to be a T-Mobile customer. I promise to make more information available to you in the coming days and weeks on OneVoice and through your leaders as this news develops. Thank you for your ongoing commitment and support.